26 And in the sixth month the angel Gabriel was sent from God unto a city of Galilee, named Nazareth, 27 To a virgin espoused to a man whose name was Joseph, of the house of David; and the virgin’s name was Mary. The angel Gabriel was sent. The Evangelist treats the history of the Virgin Mary briefly. For he does not mention her state and condition, what she was doing when the angel came to her, or in what form he appeared. But whoever wishes to know some thing about it, let him abide by the plain and simple thoughts that correspond with this history and the prophets. For that she was not very rich we can infer from the narrative. But the Evangelist does not say a word about the tribe to which the Virgin belonged, yet of Joseph he says, he was “of the house of David.” The Evangelist regards it unnecessary to mention this of her, as it had been sufficiently announced by the prophets, that Christ should come from the house of David. As the sceptre had entirely departed from Judah (Genesis 49:10) and that tribe had almost come to naught, God brings forward the poor servant, the Virgin Mary, and brings about through her the glorious work, of which all the prophets and patriarchs had preached, and filled all the world with hope. What the Gospel is. Now follows what the gospel is, and that the ministers shall teach and proclaim what shall be preached in it. In the first place, we see that the angel comes and congratulates the Virgin: “Hail, thou that art highly honored.” Happy art thou, who hast found favor with God. 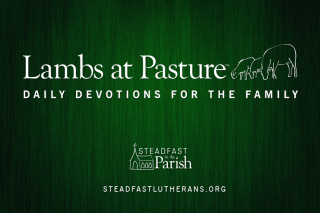 Then he delivers the message to her as he was commanded: “Thou shalt conceive and bring forth a son, and shalt call his name Jesus.” Paul also discusses these two things. In the first place, he extols the grace which has been bestowed upon us by the gospel, wakes, exhorts and comforts us. Then he begins to teach the gospel. Thus the gospel proceeds. Hence it is called “a sweet, lovely message.” To him who hears the gospel we may very well say, Praise God; God is favorable to thee, God is with thee, thou art blessed. A Christian cannot be sufficiently thankful that he has the gospel. 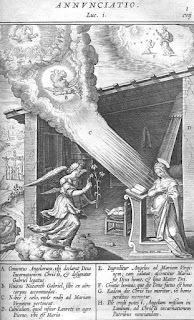 Now, this is the import of the gospel, that the angel says: “Thou shalt conceive and bear a son.” He says especially, “in thy womb,” whereby he indicates that she will not con ceive only spiritually, but also bodily, but yet through the influence of the Holy Ghost. This had also been foretold by the prophet Esaias (Isaiah 7:14). This is the sign of which he also speaks elsewhere (Isaiah 11:12). This sign is the word only; for no one can give me that of which I speak, but he gives me only a sign of the thing. Thus Christ becomes a word; this the angel brings and says, “Thou shalt conceive and bring forth a son,” etc. This and nothing else shall the ministers preach. The gospel proclaims nothing else than the Word of Christ. It is such a preaching of Christ, that he shall be born and reign, as Paul also says, “If any man preach any other gospel unto you, than that ye have received, let him be accursed.” (Galatians 1:9). Yet we should not preach it so exclusively that we merely relate the history of it, how it occurred; but we should speak as the angel does, when he says, “Thou shalt conceive,” so that every one who hears shall accept it; and she also accepted it; and let every one say, “Be it unto me according to thy word.” Christ must be conceived and born within us. There must be in the preaching only two things, as I have said; namely, the birth and the kingdom of Christ. But this is dark, and no one understands it who has not faith. Christ must die and come into an eternal and unchangeable life. Death devours him, yet leaves him living; he comes through death into eternal life. Now the life of Christ is en tirely ours; namely, what he has done and what he still does. What we have heard is not called a chronicle, but a gospel. Therefore he is born, dies, rises again, and all this is done for my good. But our doctors have not thus preached Christ, but have made only a teacher of him, and have not told us how he lives in our hearts. Thus we should preach, that all the good which is in man, (that is, all the good words, works and thoughts,) flows from the head. Thus the preaching is not per modum historiae/through the means of history; but per modum Evangelii/through the means of the Gospel. But now when reason hears the preaching, she says, just as the Virgin did, “How shall this be?” The angel answers: “The Holy Ghost shall come upon thee.” As if he had said, Only be still, and let me speak the word. It shall not be that thou canst grasp and feel it, but it shall come in a wonderful manner upon thee. This is what St. Paul says, (Galatians 3:2) “Ye received the Spirit by the hearing of faith.” Christ reigns within us, yet we do not grasp and feel him, but must accept the word only. Thus he will come and enkindle faith, only we must hold still. God gives us first the word, by which he enlightens us, then the Holy Ghost, who works within us and enkindles our faith. Hail, thou that art highly favored. And the angel came in unto her and said, “Hail, thou that art highly favored.” This angelic salutation (Ave Maria) contains no prayer, but only praise and honor; therefore we can make it neither a prayer nor an invocation; because it behooves us not to explain the words further than they read, and the Holy Ghost has put them. We may treat them as a reflection, wherein we recount the grace which God had bestowed upon her. In the first place, she is full of grace, (v. 20.) Secondly, God is with her and protects and keeps her against all that could be injurious. Thirdly, she is blessed among all women, not only because she brought forth with out woe and pain, and without hurt, above Eve and all other women; but because she became fruitful and conceived without any sin a bodily fruit by the Holy Ghost, which was never granted to any woman. Fourthly, because her fruit is blessed (v. 42;) namely, free from the curse which comes upon all the children of Eve, because they are conceived in sin and born guilty of death and damnation; but this fruit of her body alone is blessed, and through it we all shall be blessed. No one now curses this mother and her fruit so much as those who bless her with many rosaries, and constantly have the Ave Maria on their tongues; for they are mostly the ones who most curse the word and grace of Christ. Troubled in her mind. Luke says, She was troubled, not at the angel, but at his “saying and manner of salutation.” For the salutation sounds so strange to her, that she had to think it was an unnatural messenger. His words brought a blush to the pious maiden, and put her in a fright, so that she did not know what to think. Therefore the angel consoles her. Fear not. This little word did not only serve to console the maiden, but also to check the abominable idolatry of the Papists. There must always be a difference between him who gives grace, and him who receives grace. But in the Papacy everybody runs to Mary and seeks and hopes more grace and help from her, than from the Lord Christ. Shalt call his name Jesus. Here the words stand clear and distinct, “Thou shalt conceive in thy womb and bring forth a son.” Therefore this child is a true man, having body and soul like any other man, being formed in the womb, nourished and grown up like any other child. He shall be called great and shall be called the Son of the Highest. Now if this Jesus, born bodily of the Virgin Mary, is the Son of God; then it must follow, that he is also God. For what is born of God must be of his essence and quality; that is, eternal, almighty, just and immortal. One may turn as he will, whoever will not err and deceive himself, cannot pass over these words, but must admit that this child, which was born of Mary, is the true, eternal, almighty God. If this child shall possess “the throne of his father,” he must also, like his father David, be a man; else David could not be called his father, nor he be called David’s heir. But here follows a very great difference. David dies and leaves his throne and government to his son Solomon; he dies also, and so on, one dies after another, down to this child Jesus. He takes the throne of David and possesses it; not like David and others of his bodily heirs, only for a time, but “forever, and of his kingdom there shall be no end.” If then death cannot hold him, then also sin cannot have any power over him, for life and sin cannot consist together. Where there is eternal life, there can be no sin, but there must be pure righteousness and perfect fulfillment of the law. Whence then comes death to the man Christ, who was indeed no sinner, but righteous and without any sin? Hence we find the high and great consolation, that we shall look upon the death of our dear Lord Christ as an unmerited death, which was laid upon him, not on account of his own sins, but on account of our sins, in order that we, through his death, should become free from sin, and have eternal life with him. Thus the words of the angel are brief, but they have a great significance. Man and God is here one person, which dies, and yet lives forever. Death comes to him through the transgressions of others; but the life he has in himself of his own righteousness and innocence. 34 Then Mary said unto the angel, How shall this be, seeing I know not a man? Mary asks, “How shall this be?” but she asks not how it is possible according to reason, but simply, how this shall be, whether she should also have a man? 35 And the angel answered and said unto her, The Holy Ghost shall come upon thee, and the power of the Highest shall overshadow thee: therefore also the holy thing which shall be born of thee shall be called the Son of God. The Holy Ghost shall come upon thee. There are three ways of creating man! (Genesis 2:7, 22, 28; compare Acts 17:26) now he established some thing new, which shall be the fourth mode; namely, by creating a child by a virgin, as the prophet Isaiah says, (Isaiah 7:14) “A virgin shall conceive and this shall be the “sign,” or miracle. This is now the peculiar work of which the angel speaks, and which no man can ever grasp by his reason, that this Virgin is to conceive, not of a man, but of the Holy Ghost, in such a way, that the angel could announce with no better or clearer word than that “the power of the Highest shall overshadow her.” With this we should be satisfied, and not concern ourselves any further; for we shall never comprehend it; it is a divine power, which we cannot comprehend with our thoughts. This, however, we can comprehend; if this virgin conceived of the Holy Ghost alone, then her flesh is sanctified, and that which is born of her, must also be holy and without sin. Therefore also that holy thing which shall be born of thee, shall be called the Son of God. With these words the angel makes the greatest difference between this child and all other children. For although John the Baptist and some others were sanctified in their mothers’ wombs, yet they were conceived as unholy. But this child was not sanctified but sanctifies all. If we wish to be rid of our sins and become holy, we must not go to those who are themselves sinners, but we must stay by this child who is holy. And thy cousin Elisabeth, she also hath conceived a son. With this example the angel intends to show that things impossible by nature are possible with God. For with God nothing is impossible. Christ knows very well that we can not comprehend the superabundant riches of his grace; therefore he provokes us to the exercise of faith to which nothing is impossible. The handmaid of the Lord. These words show that she rejoices with all her heart, and is glad that the blessed time has come, when the devil’s head shall be bruised, and the poor miserable sinners shall be helped. For she believes both; first, that God will accomplish through her the work as the angel announces, and secondly, that this child shall have an eternal kingdom , and shall redeem her and the whole world from the kingdom of the devil and from death. And—by this faith only she has also become blessed and free from sin, and not by the work in which she brought forth the Son of God into the world. But did she readily believe all these high things? No, she verily felt a shock of unbelief in herself, else she would not have asked, “How shall this be?” As it happened to Mary with her faith, so it happens also with all of us, that we must believe that which is contrary to our perception, thoughts, experience and example. For this is the qualtity and nature of faith, that it will endure nothing beside itself, on which a man may lean, or to which he can resort or on which he can trust, except the mere word and promise of God. 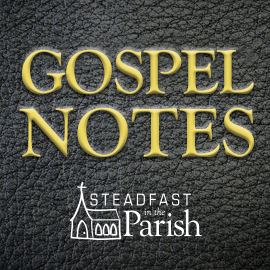 Luther’s Explanatory Notes on the Gospels, pp. 177-181. Skilfully rediscover missional financial sustainability.